The Oyama Community Club 2014 Legacy Project will commemorate the centennial anniversary of the Oyama Community Hall. The Legacy Project will include the installation of a permanent exhibition featuring the heritage of the Hall and the history of the community of Oyama. The Legacy Project will also include the installation of equipment to expand the community's use of the hall to public presentations, history talks, and community events. The Historical Walking/Driving Tour would take the participant on a journey throughout School District 69 (Oceanside) to visit 10 historic sites. Vancouver Heritage Foundation is creating an online interactive map to show the locations of all buildings and sites on the Vancouver Heritage Register, approximately 2500, with an icon that indicates the level of significance and type of site. The Hudson’s Bay Company (1849) Heritage Trail is a legally-designated historic trail linking the towns of Hope and Tulameen. It was built in 1849 by the Hudson’s Bay Company to carry furs and supplies between Fort Hope and Fort Kamloops and was the first viable European trail linking BC’s Coast and Interior. Outdoor interpretive signs will be installed along the trail route, to educate the public regarding the important history of the trail. The Town of Ladysmith is developing an interpretive display at Transfer Beach Park on Ladysmith’s waterfront. The Transfer Beach Interpretive History Pictorial Project is intended to educate residents and visitors about the site’s industrial and recreational history with historic content, stories, archival photographs and imagery. 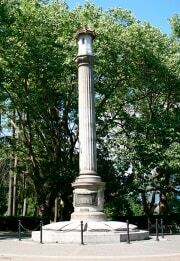 The Japanese Canadian War Memorial preservation project is being undertaken by the JCWM Committee, a program of the Nikkei National Museum to restore the 94 year old cenotaph in Stanley Park. It has not been restored nor resealed for 29 years and is in a state of deterioration, and subject to further damage from the elements. The JCWM Committee has hired Donald Luxton, Heritage Consultant to oversee the project and adhere to preservation guidelines. This project is in honour of the centenary of the Great War. The project is dedicated to repairing exterior damage to the Valemount Train Station caused by 22 years of exposure to seasonal weather conditions since the building was last restored in 1992. Specific areas that are in need of repair include paint on exterior walls, replacement of fascia boards, exterior doors and door-frames and the wheelchair ramp that provides accessibility to all community members and visitors. The project under the leadership of the Cranbrook Heritage Association will stabilize and rehabilitate the exterior of the Water & Electrical Building, and construct interior support walls that will support the new roof. This project will further the downtown revitalization effort. To repair the South east and north west facing windows. This project will preserve and restore the façade of the Rossland Miners Union Hall, a provincially designated heritage site. Elko Station is an important part of Cranbrook History Center's collection representing typical small community railway stations serving this region at the height of the railway pioneering period. The station suffered considerable fire damage due to suspected arson attack in July 2013 which has rendered the station unusable and vulnerable to further deterioration. The project is proposing to replace the materials on the current roof of the structure and on the steeple. The current roof is deteriorating rapidly and is in immediate need of repair before further damage occurs. The Mackie Lake House is located in a 5 acre setting surrounded by gardens and lawns. This project involves repairing the rock wall that contains the gardens and restoring the gardens to reflect the beauty of the heritage grounds. The restoration project for St Mary’s concerns the bell tower of the church as well as repainting and repair to the roof. The bell was manufactured was cast in 1893 by H.S. Tucksted & Co. of St. Louis, Missouri. The bell will be removed, cleaned and reattached to the wood supports, after it has been cleaned and restored, in the bell tower. The support structures inside the bell tower has dry rot and will be replaced, as will the external wooden louvers and trim boards that surround the top of the tower. These will then be repainted.